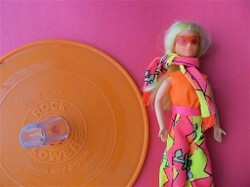 These groovy dolls from the early 70s were so "heavy" they even came with their own rockin' record discs! "Spin my record, watch me twirl!" Mattel was a powerful force in the toy market in the 1960s and 70s. They certainly have always had the doll market covered, beginning with Barbie and her friends in the early 60s and continuing today with Disney's popular "Princess" line. One of the lesser-known blips on the chart of the Mattel line of dolls was the "Rock Flower" brand. The progeneration of these dolls isn't immediately obvious but can be traced back to the ever-enduring original Barbie. The dolls also bear a striking resemblance to another line of similarly-sized dolls that came out around the same time, from a much lesser known company. Was it a coincidence or is there more to the story? Barbie was, and continues to be, an immensely popular toy. The infamous character had a whole bevy of friends and companions originally; one character that stood out briefly was Barbie's little sister Tutti (who also had a twin brother Todd). These dolls were smaller than their older sister who was statuesque at 12". Aside from being shorter, Tutti and Todd and their companions (which included an African American gal pal if you lived in Europe) were "bendies," that is, they had wires inside of latex/rubber bodies instead of the plastic body Barbie had. In fact, they looked less like relatives of Barbie than the beginning of a whole NEW franchise of toys that were smaller. Knock-offs soon followed and the "slightly smaller" doll was born. Often these dolls were made by companies that scrimped on details and materials and it was clear the dolls served two functions: they were an alternative to the look/feel of a Barbie doll and they were...cheaper to produce! Along with the "friends of Barbie" line of toys Mattel had a lot of success with "Kiddles," tiny, younger, psychedelic "mini-me" versions of Barbie (see my articles on the subject for more info). 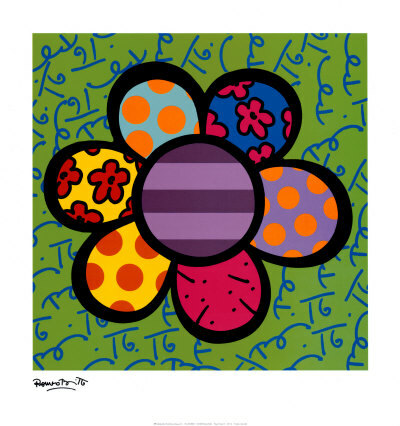 As the 60's wore on and the Peter Max-inspired psychedelic wave became more common the Kiddles' attire got progressively more colorful and wilder in tone. In 1970 Mattel introduced a new line of "hip," "now," "flower power" dolls that were half Barbie's size at 6.5" and came with their own 45 r.p.m. plastic record disc. These were the "Rock Flowers." "Spin my record, watch me twirl!" was printed on the box cover of these small dolls' packaging but you'd be forgiven if you didn't notice this slogan right away. The artwork on the boxes of these dolls is..."busy," to say the least! In truth, the blurbs of color on the boxes look like little more than some particularly enthusiastic child has been playing with fluorescent finger paints. The doll inside is attired in a way that is similarly eye-popping (or eye-tiring, depending on your tastes). The "Flowers" were the height of "fashion cool" at the time--or at least someone thought so! With their fringed vests, paisley dashikis, animal-skin looking go-go boots and huge, colored goggles they at least look like they're ready to audition for a Sid and Marty Kroft (Pufnstuf) Saturday morning kids' show. The colors of their clothes are an explosion of dischordant hues that would make even the Brady Kids blush. The dolls--at least the female ones--were named after flowers: Heather, Lilac, Rosemary and Iris. Eventually a token male, the Ken-like "Doug," was thrown into the mix, seemingly at random. The Rock Flowers were definitely a girl-power operation. The unique twist, besides the retina-burning outfits of the band, was that each doll came equipped to "dance" for her owner. Each one had a colored disc included in the package that played a song (I fear we'd be more inclined to call the Rock Flowers' music more in the "pop" than "rock" vein today), ostensibly sung by the doll pictured. The doll also came with a small clear-plastic stand. You could place your Rock Flower disc on a turntable then put the stand over the spindle (back in the "olden days" record players had long spindles to accommodate a stack of LPs to keep the rock rollin'!). You then slipped your doll on the stand on the spindle, started the record and Heather and her friends would spin around for you along with the record. Not, I suppose, the most amazing innovation and not even, perhaps, all that interesting but we had a lot of fun as kids turning the record up to *78 r.p.m. * (that's super fast for the younger readers) and spinning the dolls until their hair was flying! The Rock Flower dolls would have been more unique, and perhaps more popular, if not for the appearance of another doll who came on the scene at exactly the same time and with a similar, albeit more conservative approach: enter "Dawn" and Co. Dawn was a similarly sized female doll from the lesser-known Topper company with long, blonde hair and a rather serious, staid face. Her body shape was the same, flexible latex with wires inside and she had similar features and "playability." Like the Flowers she was advertised as a cool, hip young "chick" about town but without the burden of having to support a rather dated band behind her. There's no mention anywhere of which doll came first but there's no question that the dolls were similar and in direct competition with one another. Dawn ended up being a lot more successful than her rockin' competitor--for starters, she had many more friends, both male and female, and she also had a lot more CLOTHES. Eventually Dawn, who owned her own fashion agency, even came equipped with optional "wiglets" to change her hair style at the drop of a miniature hairpin. Being a small doll, her clothes were probably cheaper to produce and thusly cheaper to sell as well; she seems to have been on the cutting edge of shiny foil evening gowns at any rate. The dolls were cheaper than Barbie and so a fan could collect several of them. They sold like hotcakes and even topped Barbie sales for a brief period of time. Alas, Topper went out of business and by 1973 Dawn's fashion empire toppled. Today there are cult groups and fans of the Dawn legacy. Because the dolls were so prevalent it isn't too hard to find them for a decent price on eBay. What's harder to find is a doll that hasn't contracted a hideous green disease in her arms or legs; most of them suffer from having metal wires inside that have turned the rubber "skin" of Dawn an unsavory mold color over time. I always preferred my sister's Rock Flower (she had Heather) to her Dawn dolls, and I even owned my own "Doug" at one point as a kid. Aside from having friendlier faces (if you spun a Dawn doll on the record player stand she looked seasick; Heather looked delighted--or maybe just high) and the better quality of construction that Mattel brought to most of their toys; the dolls just seemed more...*interesting* to me. One can't blame the Rock Flowers for their early bad fashion sense; like Abba, they appear to have been at the mercy of their managers. If you dressed a "Rock Flower" in a Dawn outfit she looked "just like a normal person," at least one from the Mary Tyler Moore show. More importantly, the Flowers came with their own pop song; I ended up buying an old Rock Flower at a consignment shop some years ago just because I remembered one of the songs being catchy and when I played it on an old record player I found my tastes hadn't changed. The Rock Flowers had every chance to be the "Josie And The Pussycats" of their time but, as often happens with music groups in Hollywood, I guess it just wasn't meant to be! I suspect they at least influenced 80s neon similarly-color-challenged rocker dolls "Jem and the Holograms." At any rate, whenever I need a smile I look over at my lone Rock Flower doll sitting in my collectible toys case and smile; her clothes are still blindingly bright but now stand out as a symbol of her determination to be unique. And someday I might find an old record player with a long spindle, "spin her record and watch her twirl!" Which one was more cool? Glad you like the Flowers katiem2, they're certainly one of a kind, huh! I love Rock Flowers dolls. Had forgotten all about them. Thanks for the memories. I like the rock flowers best, very cool vintage toys, great colors and designs. In 1976 a new kind of toy "hero" was born. He was muscular, thick, good looking...and had expandable limbs! Behold, the wonder and prowess of the original "Stretch Armstrong!"